Between 14-16 March 2014, the Memoriae Team (members: Tudor Vişan-Miu, Mihaela Duţă, Mihai Vişan-Miu; coordinator: Mr. Dorin Călin) went to Vienna representing Romania – as the only team from our country – at the Austrian Junior Trade Fair – 15th edition, with the biographical services (Erinnerungsdienste). We participated at the fair with a grant received as an award for winning the second prize (“Best product / service”) at the National Final of the Junior Achievement “The Company” programme in Romania, on 29 May 2013. You can see photos on the Junior Enterprise Austria Facebook page. The object of your company’s activity is represented by the biographical services. These imply the gathering of one’s memories – through a number of interviews at home, and their rewrite into a book that will be printed in a few number copies, but sufficient to transmit to the descendants the memories of their forerunners, in a way that will resist the passing of time. See our company’s page on the “Enterprise without borders” website. 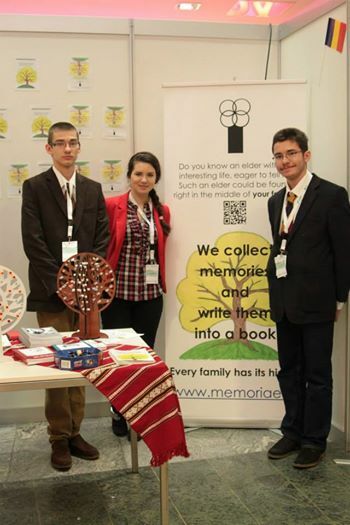 ABOUT: Memoriae is a small company from Bucharest (Romania), developed through the Junior Achievement “Compay Program”. After developing our business (we had done market research, promoted our “service of products”, participated at a regional fair of JA companies, and so on), we were selected from 465 companies between the 15 finalist teams at the “National Finals” in Romania (on 29th May 2013). Following presentations of every team’s projects, we won the “Best Product/Service of 2013”. In March 2014, we are to participate at the European Student Trade Fair.